The location was across the street from my house in Bethesda, Maryland. The "Take It!" 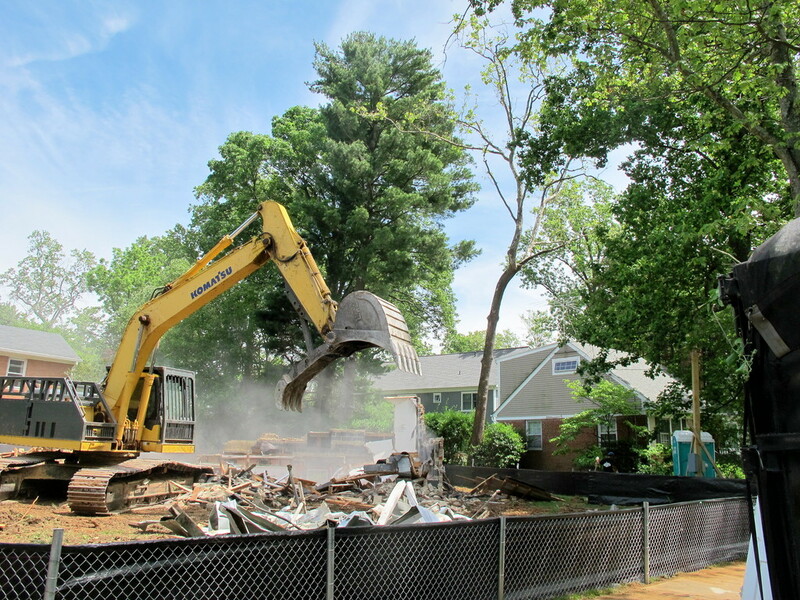 came from watching the "Tear Down" of a small house that was identical to mine making way for yet another McMansion which are now not so slowly taking over the neighborhood. I could not help but ponder how when one sees a claw hooked onto the end of a big machine, it means that the purpose for the machine includes both taking down; then often times the picking up for removal of what it took down. As these pictures show there is a near monster animal look to the open jaws of the machine. 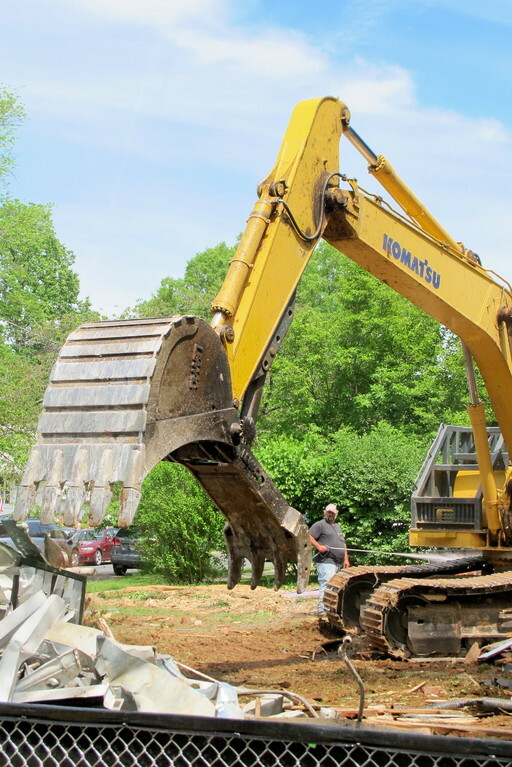 There sometimes are maneuvers that involve the picking up of debris and then giving it a shake while it is up in the air to clear some clingage to the debris that is unwanted. This part of the process gives it an even more animal like appearance. A sort of shaking the life out of it type of thing. The After Take: I have stopped and watched these operations before, sometimes watching combinations on larger buildings involving this type of machine in concert with wrecking ball swing bangs which are an almost art form. The accuracy of the operators and observing their obvious skill level can soon enough pull one in and hold one under full mesmiration. I think this seems to have a stronger magnetic pull on males of all ages than women. I once had the chance to watch a large office building being taken down directly across the street from the entrance to a busy downtown hotel. The doormen were transfixed. Most of the male guests that came out of the entrance got caught up in watching it as they were on a close schedule to catch a cab. I could see - many wanted to take the time to just stand there and enjoy watching the skills on display in rendering total destruction. I made regular frequent visits to the hotel, thus had the chance to watch the full circle of destruction, followed by a rebirth of a new structure on the same site. Sometimes some of the same machines fitted with different ends were brought in to help in the building of the new building. In time, it all became a memory with the new being now thought of as just another more efficient neighbor and even that fading into just another address number on a busy street. Every great once in a while, I have a little reminisce with the doorman about our standing there together watching those mechanical animals at work, especially when it was cold and who would want to be outside for anything. We always mention how everyone involved seemed to enjoy everything about what was happening. Could we give a reversal to Newton with "What goes down, must come up" designation to this? Here is hoping the new house is great looking and even more important that the new neighbors are as nice as those who sold the house to move closer to a school they want their daughter to go to when she reaches that age. Thanks for joining us for the current photo presentation. You are cordially invited to return Friday, June 29th for a new picture that we hope you will enjoy. Wishing you all, lots of great neighbors. I used to drive one of those bad boys for a living! It almost looks like a big metal mouth about to take a giant bite of some tasty house. At least they aren't taking out trees. You are lucky to have a job that allows you to see so much! Jeff are they hard to operate? I have always wondered this.